DPi1701 Series are discontinued. As a possible substitute, please check out the new DP400TP High Speed Graphical Display Meter for details. OMEGA’s 1/8 DIN DPi1701 Series graphic display panel meter and data logger provides unmatched display functionality and performance. The high intensity, backlit, graphic display (240 x 64 dots) provides powerful display features such as horizontal bar graph, line graph, and data logging in real time. 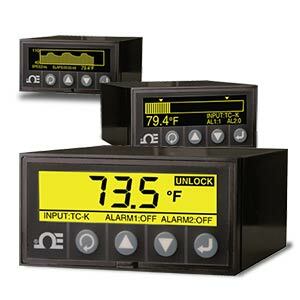 The unit can be configured to accept Thermocouples (J, K, T, E, R, S), RTDs (2- or 3-wire), Voltage (0 to 10 Vdc), or Current (0 to 20 mA). Optional features are two Form C relays, isolated USB or RS232 PC interface, isolated analog output, isolated 24 Vdc excitation, and wireless receiver. The wireless receiver accepts signals from our popular family of 2.4 GHz transmitters such as UWTC, UWRTD, UWRH, and UWIR. The graphic display deploys full word menus for configuration options, providing an easier method of programming when compared to typical panel meters with their cryptic 4 letter acronyms. These flexible meters are a great fit for typical laboratory, factory, and process monitoring applications, while the time stamped data logging capability also makes them very useful for troubleshooting and method development applications.